BP Alaska and AGDC announced the agreement yesterday to sell the company's gas reserves located at the state's North Slope Prudhoe Bay and Point Thomson sites. The parties are not disclosing how much the state would pay for the gas. Alaska's North Slope holds roughly 34 trillion cubic feet of gas, which is owned by BP PLC, ConocoPhillips and Exxon Mobil Corp. BP, which operates the Prudhoe Bay oil field, owns a 26 percent share of the gas at Prudhoe Bay and a 32 percent share of the nearby Point Thomson field. The BP-Alaska agreement marked the first time that a company has signed a pact to sell its gas into the Alaska LNG project. That proposed megaproject would consist of a gas treatment plant on the North Slope, an 800-mile pipeline through the heart of the state, and a liquefaction and export facility in Nikiski south of Anchorage. In signing the agreement with Alaska, BP officials voiced support for the state gas line project. "We are very pleased to be part of the State's vision to bring Alaskan natural gas to new and expanding markets globally," BP CEO Bob Dudley said in a statement. "We think this is good for the state, good for BP and good for the environment." The pact also won praise from Alaska Gov. Bill Walker (I), a major champion of a state-owned gas project. "This agreement means Alaskans are one step closer to finally monetizing the vast reserves of natural gas on the North Slope," Walker said. "The end result will be thousands of jobs, a significant reduction in energy costs to power homes and businesses, and cleaner air." A small portion of the natural gas would be sold to Alaska customers. But 75 percent of the fuel might be shipped to China under a nonbinding joint development agreement that Chinese companies signed last year with Alaska. The two sides are aiming to complete the agreement by the end of 2018. In the meantime, either party can withdraw from the deal at any time. Under that tentative agreement, Bank of China Ltd. and CIC Capital Corp. would provide 75 percent of the funding — roughly $32 billion — to build the Alaska LNG project. The state would repay that loan by providing China Petrochemical Corp. with 75 percent of the LNG capacity of the Alaska pipeline for the length of the loan. 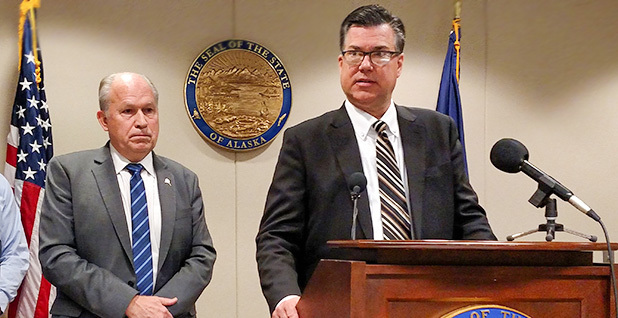 Alaska anticipates financing the remaining 25 percent of the pipeline costs — $11 billion — from financial investors, Alaska Native corporations, and state municipalities and residents. The state also could issue tax-exempt bonds or use general funds with legislative approval. AGDC President Keith Meyer described the BP agreement as a major step in moving forward with the Alaska LNG project. "We have secured the customers, we have progressed on the pipeline build with regulators and the finance community, and now we have a commitment that there will be gas to sell and put through the pipeline," Meyer said. "I look forward to continued negotiations to secure supply from other North Slope producers."